The best way to stay informed about the most important issues going on in The Villages. If you've ever read The Kiplinger Letter®, this will look and feel very familiar to you. Just the facts you need to know...without bias and without fluff. 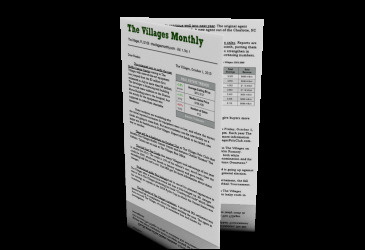 We gather each months news from more than 50 newspapers, websites, and magazines writing about The Villages. We do not accept advertising, nor are we a developer run publication (unlike the local newspaper and monthly magazine). We work for you, the reader. If you are ever dissatisfied for any reason, simply cancel your subscription at any time and request a 100% refund for any unused issues.